Chlorella pyrenoidosa is one of the single-celled eukaryotic freshwater algae that has high photosynthetic activity and therefore has a large amount of chlorophyll, a pigment that is contained in chloroplast organelles, and is involved in the first phase of photosynthesis at the end of which glucose is formed from carbon dioxide and water. It has a similar structure to haemoglobin, but the central ion isn’t iron, but magnesium. 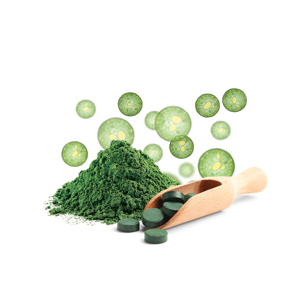 Chlorella pyrenoidosa has a globular shape and a solid cell wall that protects it against adverse living conditions. When multiplying, it forms a continuous biomass. It’s currently grown in large quantities then collected and processed into powder, pills, etc. We would like to inform you that we can no longer present claims that might imply any healing effect of herbs or fungi on our website. It’s prohibited by existing EU legislation. Even though traditional Chinese medicine has worked for thousands of years and has been tested on an immense number of patients. We also we can’t mention the effects proved by current scientific studies. But we believe in our customers' common sense. Detailed information on herbs and fungi is available in publicly available sources on the Internet. Valuable information is available at www.cinskyherbar.cz or www.tcmencyklopedie.cz.